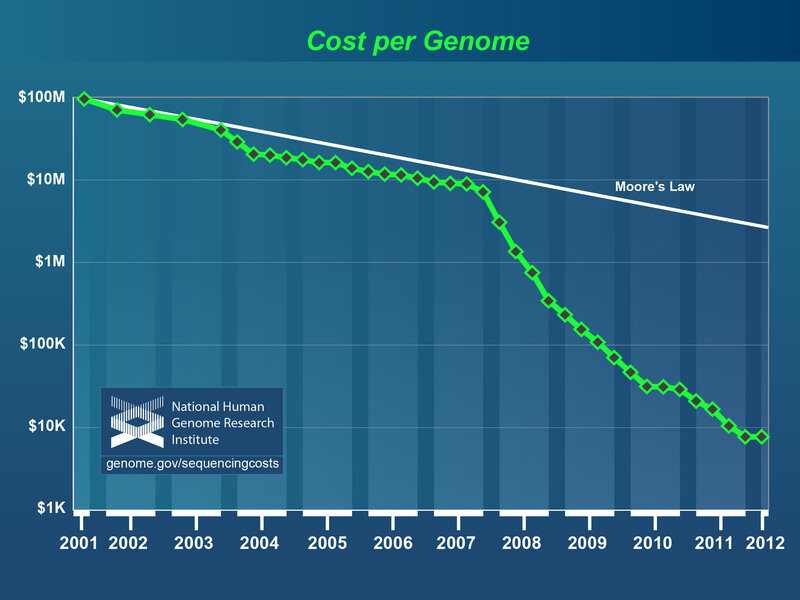 The first human genome, which was completed in 2003, was sequenced at a cost of $2.7 billion dollars. 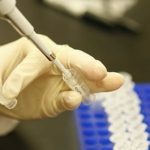 Incredibly, it is now possible to sequence an entire human genome for less than ten thousand dollars, and this cost is expected to continue decreasing. (b) Now that it has become technically and economically feasible to obtain massive amounts of genomic data, a new set of challenges arises. In the pre-genomic era, researchers could sequence individual genes, but they had to pick likely candidates and could sequence only a handful. In the haystack that is the genome, a genetic mutation was the proverbial needle. Now that researchers can obtain information on every piece of hay in the stack, we know that each genome contains hundreds or thousands of these needles. 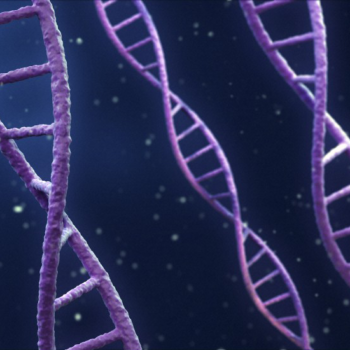 Although it is no longer difficult to find genetic mutations, researchers are now faced with the challenge of determining which ones have functional consequences in health and disease. The key to separating the important mutations from the genetic noise will be the ability to compare many hundreds of genomes in order to see which mutations recur in the context of particular diseases. Until recently, that kind of experiment was prohibitively expensive. 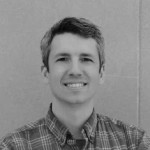 Now, as the cost of sequencing has dropped, so too has the barrier to performing the kinds of comparative studies that should have a tremendous impact on our understanding and treatment of disease. One of the diseases that will be especially impacted by low-cost, high-throughput sequencing is cancer. Genetics has long been central to our understanding of cancer. 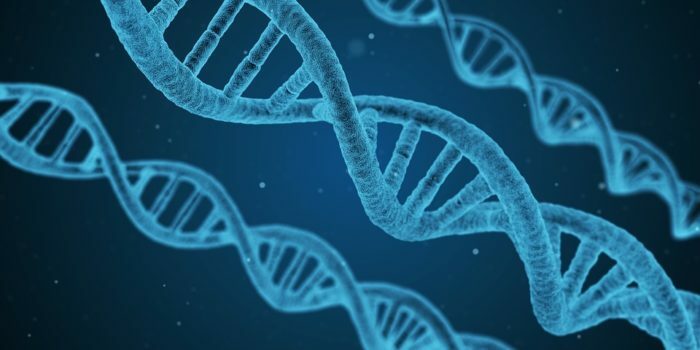 Inherited genes can increase a person’s risk of cancer and it is mutations acquired during the course of one’s life that cause a tumor to form, develop and, eventually, kill. Because of its strong genetic component and significant impact on public health, this disease has been a focus for applying new genomic technologies. One major project, The Cancer Genome Atlas (TCGA), coordinates a national network of researchers to sequence multiple samples from 20 different tumor types in order to determine which genes are mutated in which cancers. (c) Mutations that are found in many samples from a given cancer are likely to play an important role in that disease and represent good potential targets for therapeutic intervention. While TCGA and programs like it examine the genetic variation across cancer types, other efforts are aimed at uncovering the genetic diversity that lies within a single tumor. (d) Two recent papers in the journal Cell document efforts to sequence DNA from as many as 58 individual cells within a single tumor in order to understand its unique genetic development.1 The hope is that these types of experiments will shed light on the order in which mutations are acquired, giving clues as to the importance and function of each mutation. In a way, the concept of linking mutational status to drug susceptibility is not new. For drugs such as Zelboraf, which was recently approved for use in melanoma, patients are screened for mutation of the drug target before being prescribed the drug. 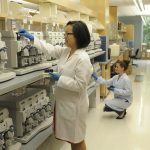 (f) The difference in these latest studies is that the cell lines were screened for mutations in hundreds or thousands of individual genes as well as large-scale changes in DNA structure and the production of RNA. By having information about a huge range of genetic changes instead of just the ones that are known targets of a drug, the researchers were able to find novel predictors of drug sensitivity that would not have been inferred from prior knowledge. Hopefully, as comprehensive analysis of tumor genetics becomes a common part of patient care, the information gleaned from these types of studies can serve as a guide, allowing clinicians to tailor treatment to each patient’s personal disease genome profile. Y. Hou, et al. (2012) “Single-cell exome sequencing and monoclonal evolution of a JAK2-negative myeloproliferative neoplasm,” Cell, 148(5): 873  885. X. Xu, et al. (2012) “Single-cell exome sequencing reveals single-nucleotide mutation characteristics of a kidney tumor,” Cell, 148(5): 886  895. M. J. Garnett, et al. (2012) “Systematic identification of genomic markers of drug sensitivity in cancer cells,” Nature, 483(7391): 570  575. J. Barretina, et al. (2012) “The Cancer Cell Line Encyclopedia enables predictive modelling of anticancer drug sensitivity.” Nature, 483(7391): 603  607. (a) Moore’s law is a remarkably accurate observation made by Intel co-founder Gordon Moore in 1965 about the rapid growth of computing power. It states that the number of transistors that can fit on a chip doubles every two years. This exponential growth enabled the revolution in computing and electronic technology witnessed over the last fifty years. 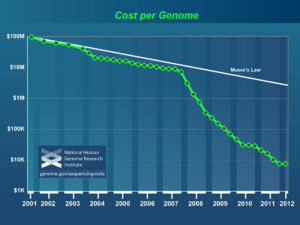 (b) In mid-2007, the cost of sequencing a human-sized genome was $10 million. In four short years, next-generation sequencing technologies reduced the cost to less than $10,000. (c) TCGA is in many ways a descendent of the Human Genome Project, the landmark collaborative research effort to map the human genome. Begun in 1990, it took 13 years and cost nearly $3 billion. (d) The acronym for The Cancer Genome Atlas, TCGA, is a play on the four nucleotide bases that make up DNA: thymine, cytosine, guanine, and adenine. (e) Cancer cell lines are derived from tumors and grown in the lab on plastic dishes. Because they typically reproduce quickly, indefinitely, and cheaply, they are an invaluable tool for biochemists and cancer biologists. The main downside of cell lines is that they lack much of the normal physiological context of a cancer cell growing in a human or a mouse. The responses seen in cancer cell lines are not always reproduced in real tumors. (f) Zelboraf is part of a new generation of cancer drugs that are much more targeted than traditional chemotherapy. 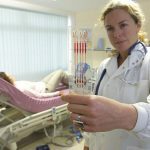 In 2010, the New York Times ran a prominent series on the drug’s development and clinical testing.